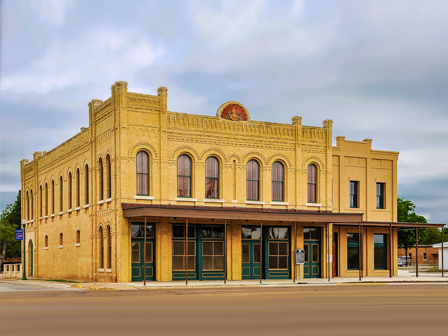 302 North Esplanade, Cuero, DeWitt Co.
For Cuero, Texas, a community of 7,004 citizens, the Knights of Pythias Hall with its fanciful brickwork and 10,000 square feet of space represents a glorious past and a promising future. Built in 1903 by James Wahrenburger, the Hall was was acquired in 2002 by the Chisholm Trail Heritage Museum with the intent on transforming the building into exhibit space and meeting rooms. Work began by stabilizing the building’s outer shell and restoring the two primary facades. Brick details were replicated using historic photographs and nearly 100 years of paint was removed from the front. This phase also included the restoration of all original wood windows. The original copper Knights of Pythias emblem was replicated and placed in the central arch on the parapet wall.